Simple, sweet and uncomplicated, Naanum Rowdy Dhaan is a romantic comedy that deserves a watch, writes S Saraswathi. After the spectacular success of Velaiyilla Pattathari and the National award-winning Kaaka Muttai, Dhanush’s Wunderbar Films has another winner. 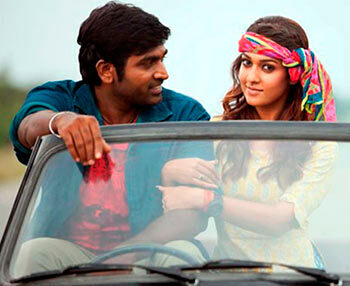 Naanum Rowdy Dhaan is directed by Vignesh Shivan of Podaa Podi fame, and star Vijay Sethupathi and Nayanthara. Anirudh Ravichander's music is already a hit. The terrific background score and soulful romantic melodies are the biggest strengths of the film, especially the songs Thangamey and Neeyum Naanum. Naanum Rowdy Dhaan is not your average romantic comedy. Besides the beautiful love story, it also tells the story of a deaf girl seeking vengeance for the murder of her parents. The film is a delightful mixture of humour and emotions and has you completely hooked. Kadambari (Nayanthara), daughter of an honest police officer, has a traumatic past. She loses her mother in a bomb explosion that also affects her hearing. The cause of all her troubles is Killivalavan (Parthiban), a local rowdy with powerful political connections. He kills her father, who attempts to seek revenge. Left all alone, Kadambari decides to hire a bigger rowdy to destroy Killivalavan. She meets Pandi (Vijay Sethupathi) and his gang of weird friends, who pretend to be rowdies. Though she has no faith in their abilities, she is convinced by Pandi, who falls in love with her at first sight. The second half is a hilarious account of how they eventually manage to confront the dangerous Killivalavan with their half-baked schemes. Vignesh seems to have chosen the perfect cast to give life to his intriguing script. It is not just the lead actors, who have outclassed themselves, but the terrific supporting team too. Nayanthara is brilliant, flawlessly mimicking the body language and gestures of the hearing impaired. Though a bold role, the versatile actress adds an air of vulnerability to the character, that is endearing. This is also the first time the actress has dubbed for herself. Vijay Sethupathi has yet again chosen a character that is unlike his previous roles. His ability to live every character he plays is remarkable. As a fake rowdy out to impress his girlfriend, his false bravado is both fun and heartwarming. A lot of thought seems to have gone into detailing the characters, be it the unconventional Parthiban, Raadhika Sarathkumar, who plays Vijay Sethupathi’s mother, Mansoor Ali Khan or the hilarious RJ Balaji. Crisp editing by Sreekar Prasad and ingenious camera angles by George C Williams make the film even more enjoyable. But it is undoubtedly director Vignesh’s show all the way. He deserves credit for putting it all together. Simple, sweet and uncomplicated, Naanum Rowdy Dhaan is a refreshing romantic comedy that deserves a watch.